Balloon Cupcakes are one of the easiest decorating ideas you can use for any birthday party. 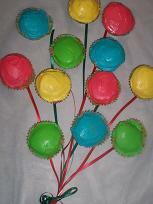 Follow these simple instructions to make a bunch of colorful balloon cupcakes. Make a batch of cupcakes - making sure that there is at least one cupcake per birthday guest - and then get ready to decorate. Let your imagination soar! You need a large, flat plate or board to put the balloon cup cakes on. I always cover my board in wrapping paper in a color that suits my theme. Pale blue wrapping paper will look great as the bunch of balloons really will look as if they are floating high. Make up a quantity of glace frosting or buttercream frosting and then separate into several smalls bowls, according to the number of colors you intend using. Add a few drops of coloring to each bowl and blend in. I think the frosting colors need to be very bold for this birthday theme. Ice the birthday cupcakes and arrange them on the board. Use leftover icing to attach lengths of ribbon to the bottom of each cupcake. Tie all the ribbons together and curl the ends as shown.